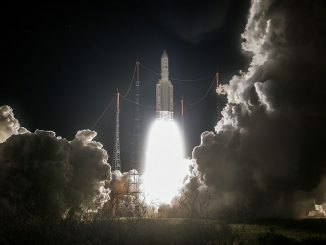 Two telecommunications satellite for Latin America are counting down to liftoff Thursday aboard an Ariane 5 rocket from French Guiana. The powerful 18-story launcher is set to ignite its hydrogen-fueled Vulcain 2 main engine and twin solid rocket boosters at 2100 GMT (5 p.m. EDT; 6 p.m. French Guiana time) to begin a 34-minute flight to deploy the Intelsat 30 and Arsat 1 communications satellites in orbit. Thursday’s launch window extends for 51 minutes. Heading east over the Atlantic Ocean, and surpassing the speed of sound in 42 seconds after liftoff, the Ariane 5 rocket will release its two solid rocket boosters, jettison a clamshell-like nose cone covering the Intelsat 30 and Arsat 1 satellites, and exhaust its first stage propellant in the first 9 minutes of the flight. An upper stage HM7B engine will ignite and consume a mix of liquid hydrogen and liquid oxygen propellants for nearly 16 minutes to reach an egg-shaped geostationary transfer orbit with an altitude ranging from a high point of 22,236 miles (35,786 kilometers) to a low point of 155 miles (250 kilometers) with an inclination of 6 degrees. Thursday’s Ariane 5 flight, called VA220 in Arianespace’s launch naming scheme, will mark the heavy-lift launcher’s fifth mission this year. Intelsat 30 will ride in the Ariane 5 rocket’s upper berth, heading for a 15-year mission to provide Ku-band direct television services for DirecTV Latin America and C-band services for Intelsat’s own business in Latin America. The smaller Arsat 1 spacecraft is the first geostationary communications satellite built in Argentina. It will support television broadcasts, data transmission and Internet access for customers in Argentina, Chile, Uruguay and Paraguay. 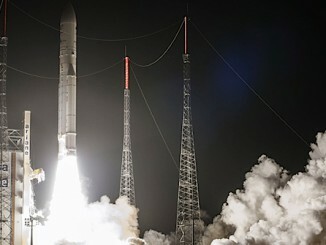 Intelsat 30, also known as Intelsat DLA-1, will raise its orbit to geostationary altitude 22,300 miles over the equator. Its final operating position will be at 95 degrees west longitude. Arsat 1 is destined to be positioned in geostationary orbit at 71.8 degrees west longitude. The 6.9-ton Intelsat 30 satellite was manufactured by Space Systems/Loral of Palo Alto, Calif., and carries 72 Ku-band transponders and 10 C-band transponders. 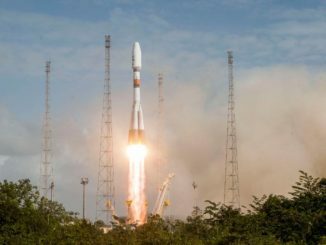 DirecTV Latin America is leasing the spacecraft’s Ku-band capacity — along with 72 more Ku-band transponders on sister satellite Intelsat 31 set for launch next year — to grow the company’s television broadcasting portfolio in Central and South America and the Caribbean. Intelsat 30 will be co-located with the Galaxy 3C spacecraft, which is also used by DirecTV Latin America. Built by INVAP, an Argentine high-tech contractor, the 6,580-pound Arsat 1 spacecraft is designed for a 15-year mission. The satellite’s operator is Arsat, a national telecom company backed by the government of Argentina. The Arsat 1 project reportedly cost about $250 million.